Great men do not take birth so often, and men with fierce patriotism are still rare. 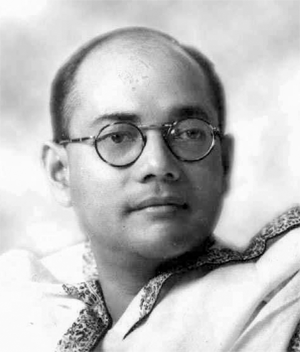 Subash Bose was both - a great man and a great patriot. India celebrated his 115th birthday yesterday. Born on January 23, 1897 in Cuttack, Orissa Subash showed signs of noble qualities and academic brilliance from very young days. In Ravenshaw Collegiate School, Cuttack he was deeply influenced and motivated by the Head Master, Beni Madhav Das and developed in his heart a burning sense of patriotism. Beni Madhav Das, as a result, was punished and was transferred from the school by the British authorities. Subash was committed to fight for India's independence. Though he stood fourth in the prestigious ICS examination in England, he tore the certificate and threw into the sea as the ship was approaching Bombay port! Soon he joined the freedom movement launched by Mahatma Gandhi, and took charge of the younth wing of the Congress. During the freedom struggle he was imprisoned many times and even lived in exile. A great follower of Swami Vivekanand, he admired Chitta Ranjan Das. He was Congress President in 1938 and once again won the next year. However, his views differed from those of Gandhi ji, and he escaped from the jail and travelled to Russia. Disillusioned by Soviet communism, he traveled to Japan and started Indian National Army (Azad Hind Fauz) to fight the British. He entered into British India territory from Burma and hoisted Indian National Flag. He gave immortal clarion calls, 'Jai Hind', 'Delhi Chalo', 'Delhi Door Nahin'. Subash was like a meteor, he rose high and vanished, too, his death is shrouded with mystery. In stead of a cozy life, this fearless patriot moved in hills and jungles to win freedom for India. He made supreme sacrifices and shall be in the minds of a grateful nation for all the time to come. Well, Rupradha, words will fall short o describe this firebrand; the flame of patriotism was ever burning within him. Very few nations across the globe had such a leader in their histories. he is a legend Sir!! nice article! !